2012 – the Year of the Infidel? Well not on the evidence of what anti-fascists saw in Bolton today. 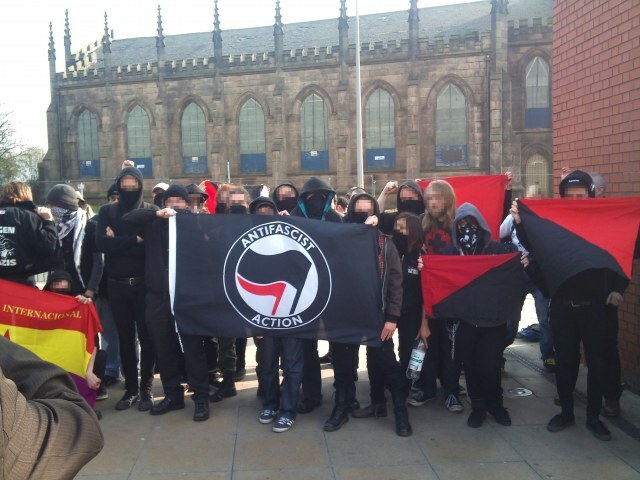 A pitiful turn out of around thirty (maybe forty) of the North West Infidels and the Combined Ex Forces was confronted by a UAF crowd of over a hundred and at least sixty non-aligned anti-fascists. From the outset it wasn’t clear what the Infidels (an overtly racist splinter group of the EDL) were actually demonstrating about and those not actively hostile to them just looked on in bemusement. Probably due to their pre-match bragging about violence on Facebook, the Infidels were bussed under police supervision from their muster point to a pre-prepared pen at the arranged time of 1p.m. A few EDL stragglers did hang around the pubs in the vicinity to jeer at the UAF before beating a retreat to the bar. After the rally was over anti-fascists patrolled the town unopposed. Posted on March 25, 2012, in Events. Bookmark the permalink. Leave a comment.